WHAT DRAWS PEOPLE TO THE GREAT PYRAMID OF GIZA? Throughout history, why have so many people been drawn to the Great Pyramid of Giza? What are they looking for? Some people study the Great Pyramid from purely an academic motive. They may be archeologists, historians, scientists, mathematicians, etc. and a certain aspect of their work involves the Great Pyramid. But what about the average person who does not need to investigate the pyramid due to their profession but are drawn to it by some unknown force. Throughout history, many well known individuals and great leaders were fascinated by the Great Pyramid. Alexander the Great was drawn to the Great Pyramid and visited it. Napoleon also visited the Great Pyramid and even spent time alone in the King's Chamber. Sir Isaac Newton was extremely interested in the Great Pyramid and even wrote a dissertation on it. Many well known explorers made it a point to visit the Great Pyramid of Giza. Also many common everyday people have gone out of their way to visit and explore the Great Pyramid. Many who have not had the opportunity to go to Egypt have undertaken an intensive and life long study of the Great Pyramid. There is no common denominator. People from different cultures, walks of life, diverse time periods, rich or poor, great or small, have been drawn to the Great Pyramid. What are they searching for? Maybe it is for purely scholarly reasons or maybe something else draws them to the Great Pyramid. Another possibility is that people are drawn to the Great Pyramid of Giza because they are searching for answers about life. They want to know who they are, where did they come from, is there an afterlife, is there a God, etc? 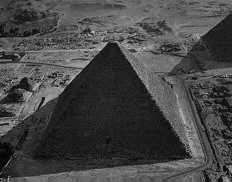 Since the Great Pyramid has always been enshrouded in mystery, many people think it may contain the answers to some of these questions. One thing is obvious. The Great Pyramid is unusual. It is one of the largest known structures and is stupendous. Just looking at it leaves one in awe. This is enough to draw one to it with questions like who built it, when, why, etc? Also throughout history, mountains, monuments, elevated places, etc. know as "High Places" have usually been associated with God and his revelation to man. For example, Moses received the laws on a mountain from God. Hammurabi also received the Code of Hammurabi on a mountain from a god. The tower of Babel was built to reach heaven. Legend has it that there was a mountain in the center of Atlantis that reached up to heaven. We build cathedrals and churches that are structurally very high to symbolize our reaching up to heaven. The Great Pyramid is one of the highest structures in the world today and was the highest one in ancient times. Just looking at it gives us the sense of the infinite. Also there is a mystery associated with the Great Pyramid. Why was it built, for what purpose, who built it and when? Does it have any significance or purpose for us today? Does it contain any hidden or lost information? As you know, archeologists have been searching for hidden chambers and passages for some time. Some are searching for lost treasures and others for lost secrets from an ancient civilization. Just the mystery of it is enough to attract people to explore and study it. Also many are drawn to the Great Pyramid because of their interest with its architecture, mathematics, passage system, astronomical alignment, etc. Also scholars from many disciplines (science, history, archeology, mathematics, engineering, architecture, art, etc.) are drawn to study the Great Pyramid as it relates to their field of study. As you can see, there are many reasons people are drawn to the study the Great Pyramid. Whatever the reason, the study of the Great Pyramid is very exciting and challenging.